bDepartment of Biostatistics and Epidemiology (S.M., M.D.S. ), Case Western Reserve University, Cleveland, Ohio. BACKGROUND AND PURPOSE: MR imaging and PET/CT are integrated in the work-up of head and neck cancer patients. The hybrid imaging technology 18F-FDG-PET/MR imaging combining morphological and functional information might be attractive in this patient population. The aim of the study was to compare whole-body 18F-FDG-PET/MR imaging and 18F-FDG-PET/CT in patients with head and neck cancer, both qualitatively in terms of lymph node and distant metastases detection and quantitatively in terms of standardized uptake values measured in 18F-FDG-avid lesions. MATERIALS AND METHODS: Fourteen patients with head and neck cancer underwent both whole-body PET/CT and PET/MR imaging after a single injection of 18F-FDG. Two groups of readers counted the number of lesions on PET/CT and PET/MR imaging scans. A consensus reading was performed in those cases in which the groups disagreed. Quantitative standardized uptake value measurements were performed by placing spheric ROIs over the lesions in 3 different planes. Weighted and unweighted κ statistics, correlation analysis, and the Wilcoxon signed rank test were used for statistical analysis. RESULTS: κ statistics for the number of head and neck lesion lesions counted (pooled across regions) revealed interreader agreement between groups 1 and 2 of 0.47 and 0.56, respectively. Intrareader agreement was 0.67 and 0.63. The consensus reading provided an intrareader agreement of 0.63. For the presence or absence of metastasis, interreader agreement was 0.85 and 0.70. The consensus reading provided an intrareader agreement of 0.72. The correlations between the maximum standardized uptake value in 18F-FDG-PET/MR imaging and 18F-FDG-PET/CT for primary tumors and lymph node and metastatic lesions were very high (Spearman r = 1.00, 0.93, and 0.92, respectively). CONCLUSIONS: In patients with head and neck cancer, 18F-FDG-PET/MR imaging and 18F-FDG-PET/CT provide comparable results in the detection of lymph node and distant metastases. Standardized uptake values derived from 18F-FDG-PET/MR imaging can be used reliably in this patient population. Head and neck cancers are relatively common malignancies in the United States,1,2 with an incidence estimated between 10 and 20 cases per 100,000 per year.3 Multimodal complex therapy protocols are established, which include chemotherapy, radiation therapy, and surgical resection.4 Accurate staging and re-staging are essential for selection of the appropriate treatment approach in individual patients. Uptake of PET tracer can be visualized and quantified by using standardized uptake values (SUVs). Early comparisons of SUVs between PET/MR imaging and PET/CT from our group and others in healthy tissue of oncology patient population have shown good agreement.10,11 The logical next step is to analyze correlations of SUV in a variety of pathologic conditions in order to use the values derived from PET/MR imaging data reliably in patients for quantification of studies. The purpose of this prospective study was to systematically analyze lymph node and distant metastases detection qualitatively on whole-body 18F-FDG-PET/MR imaging versus 18F-FDG-PET/CT in patients with head and neck cancer. A further aim of this study was to compare SUVs of 18F-FDG-avid lesions as a quantitative measure of tracer uptake in whole-body 18F-FDG-PET/MR imaging versus 18F-FDG-PET/CT. The Health Insurance Portability and Accountability Act–compliant study was approved by the local ethics committee. All patients gave written informed consent before enrollment in the study. Fourteen patients with head and neck cancer (13 men; mean age, 54.7 ± 8.2 years) were included in the study. The baseline characteristics of the patients are listed in Table 1. The patients were referred for a clinically indicated 18F-FDG-PET/CT and then underwent a 18F-FDG-PET/MR imaging. Two of the 14 patients underwent PET/MR imaging first followed by PET/CT. PET/CT was performed 63 ± 6 minutes and PET/MR imaging was conducted 100 ± 34 minutes after 18F-FDG injection. The mean injected dose of 18F-FDG was 11.7 ± 1.4 mCi. Only patients with head and neck cancer 18 years or older who were referred by their physicians for clinical PET/CT were eligible for the study. All consecutive patients who gave written informed consent were included in the analysis. Exclusion criteria were as follows: 1) patients who were not able to give informed consent (cognitive impairment), 2) pregnant women, 3) implanted metallic or electronic devices, 4) hip or other joint replacements, and 5) a history of kidney disease, with high creatinine levels or a low glomerular filtration rate. The PET/CT studies were performed, as previously described, according to a standard clinical protocol.12 In short, a large-bore PET/CT with time-of-flight technology was used (Gemini TF PET/CT; Philips Healthcare, Best, the Netherlands). PET/CT images were acquired in 9–10 bed positions, with 90–120 seconds per bed position. For attenuation-correction and anatomic localization purposes, a low-dose CT protocol without contrast administration was acquired (parameters: 120 kV; 100 mAs; dose modulation; pitch 0.813; slice thickness 5 mm). The overall imaging time for PET/CT was 17 ± 2 minutes. 18F-FDG-PET/MR imaging was performed on a combined current-generation time-of-flight PET and a 3T MR imaging system (Ingenuity TF PET/MR; Philips Healthcare). PET/MR images were acquired in 9–11 bed positions, with 120–150 seconds per bed position to compensate for radiotracer decay in those cases in which PET/MR imaging was performed after PET/CT. The MR imaging component was performed with an integrated radiofrequency coil and a multistation protocol. In the protocol, the slab size was 6 cm and the maximum FOV was 46 cm. For attenuation correction, a whole-body free-breathing 3D T1-weighted spoiled gradient-echo sequence (sequence parameters: TE, 2.3 ms; TR, 4 ms; 10° flip angle) was acquired. The automatic attenuation-correction procedure was performed according to a previously published method, leading to a 3-segment model with differentiation of air, lung, and soft tissue.13 The overall time for PET/MR imaging was 29 ± 31 minutes. Qualitative reading and quantitative measurements were performed with commercially available software (MIM, Version 5.2; MIM Software, Cleveland, Ohio). For the qualitative reading, a 2-step approach was used. Initially, 2 independent groups of readers (1 radiologist and 1 nuclear medicine physician per group) read the 28 examinations (14 PET/CT and 14 PET/MR imaging) in a blinded and randomized fashion. After an initial assessment on interreader agreement, a consensus reading was performed in those cases in which the 2 groups disagreed. This second step was also performed in a randomized and blinded fashion and included 18 examinations, corresponding to 9 patients. Clinical follow-up based on patient charts confirmed the presence or absence of head and neck cancer. Quantitative analysis of the detected lesions was performed by an experienced board-certified nuclear medicine physician (J.L.V.-C.) through the placement of spheric ROIs over the lesions in 3 different planes (axial, sagittal, and coronal). Maximum SUVs of the lesions, both in PET/CT and PET/MR imaging, were recorded. Unless otherwise specified, continuous data are reported as mean ± SD. For the first reading, inter- and intrareader agreement was assessed for the number of lesions by using weighted κ statistics. For the first reading, inter- and intrareader agreement was also assessed for the presence or absence of distant metastases (metastases yes or no) by using an unweighted κ statistics. Interreader agreement for PET/CT and PET/MR imaging was evaluated between groups 1 and 2. Intrareader agreements for groups 1 and 2 were evaluated between PET/MR imaging and PET/CT. For the second reading, intrareader agreement for the number of lesions was assessed between PET/MR imaging and PET/CT by using a weighted κ statistics. In this reading, the number of lesions ranged from 0 to 9, and they were categorized as 0, 1, 2, 3, 4, 5 or more. For the second reading, intrareader agreement for the presence or absence of distant metastases (metastases yes or no) was evaluated as well between PET/MR imaging and PET/CT by using an unweighted κ statistics. For interpretation of the κ statistics, we applied the established criteria of Landis and Koch 14: κ values in the range of <0.0, 0.0–0.20, 0.21–0.40, 0.41–0.60, 0.61–0.80, and >0.80 represented poor, slight, fair, moderate, substantial, and almost perfect, respectively. For the assessment of maximum standardized uptake value (SUVmax), a clinical (primary tumor, lymph node, and distant metastases) and a localization (for distant metastases: bone, liver, and lung lesions) based assessment were performed. Spearman correlation coefficients between SUVmax in PET/MR imaging and PET/CT were calculated. Differences between SUVmax in PET/MR imaging and PET/CT were tested by using the Wilcoxon signed rank test. Interpretation of the Spearman correlation coefficients was performed per established standards as previously described10: A value ≤0.35 represented a weak correlation; a value between 0.36 and 0.67 represented a moderate correlation; a value between 0.68 and 1.0 represented a high correlation, where a value of ≥0.90 represented a very high correlation. For differences in the Wilcoxon signed rank test, P < .05 was considered significant. 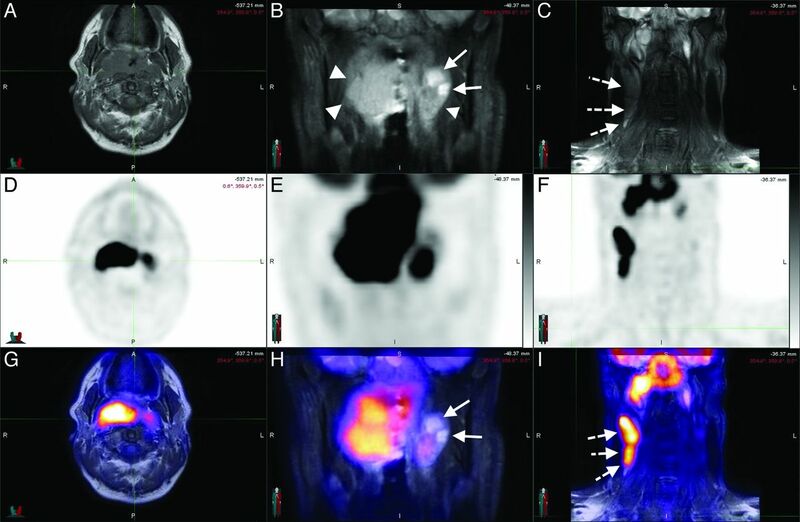 Three representative PET/MR imaging cases of head and neck cancer of the study are shown in Fig 1 and On-line Figs 1 and 2. A 44-year-old man with squamous cell carcinoma of the nasopharynx. Axial T1 (A) and coronal STIR (B and C) sequences, with corresponding PET (D–F) and the fusion of both (G–I), in a patient with nasopharyngeal carcinoma. The neoplastic tissue (arrowheads) is easily identifiable in STIR sequences (B) in which the cystic component can be visualized (arrows). The T1-weighted sequences allow a good assessment of the fat planes. Metastatic lymph nodes (dotted arrows) can be assessed morphologically (C) and functionally (I). Notice the concordance of the cystic areas of the lesion with an area of lower 18F-FDG uptake as expected. Agreement on the Number of Lesions (Pooled across Regions). For the first reading, interreader agreements between groups 1 and 2 were moderate for both imaging modalities: Weighted κ values were 0.47 (95% CI, 0.30–0.63) and 0.56 (95% CI, 0.34–0.78) for PET/MR imaging and PET/CT, respectively. For the first reading, intrareader agreements between PET/MR imaging and PET/CT were substantial for both groups: Weighted κ values were 0.67 (95% CI, 0.45–0.88) and 0.63 (95% CI, 0.45–0.80) for groups 1 and 2, respectively. For the second reading, intrareader agreement between PET/MR imaging and PET/CT was substantial (0–5 or more lesions): The weighted κ was 0.63 (95% CI, 0.47–0.79). Agreement on the Presence or Absence of Metastases. For the first reading, interreader agreement between groups 1 and 2 was almost perfect for PET/MR imaging and was substantial for PET/CT: Unweighted κ values were 0.85 (95% CI, 0.56–1.00) and 0.70 (95% CI, 0.33–1.00) for PET/MR imaging and PET/CT, respectively. For the first reading, intrareader agreement between PET/MR imaging and PET/CT was substantial for group 1 and almost perfect for group 2: Unweighted κ values were 0.69 (95% CI, 0.30–1.00) and 0.84 (95% CI, 0.55–1.00) for groups 1 and 2, respectively. For the second reading, intrareader agreement between PET/MR imaging and PET/CT was substantial: The unweighted κ value was 0.72 (95% CI, 0.38–1.00). The statistical analysis of the clinical-based assessment of the SUVmax values is shown in Table 2. The scatterplot for visualization of SUVmax correlation of 18F-FDG-avid lymph node lesions is shown in Fig 2. Because there were only 4 primary tumors, a scatterplot for the primary tumors was not created. Very high correlations between SUVmax in PET/MR imaging and PET/CT could be found for primary tumors and lymph node and metastatic lesions (Spearman r = 1.00, 0.93, and 0.92, respectively). The absolute values were higher in PET/MR imaging compared with PET/CT for primary tumor and lymph node and metastatic lesions. This increase in SUVmax for PET/MR imaging versus PET/CT was statistically significant for lymph node and metastatic lesions (P < .0001 for both), whereas the difference did not reach the significance level for the primary tumor lesions (P = .875). 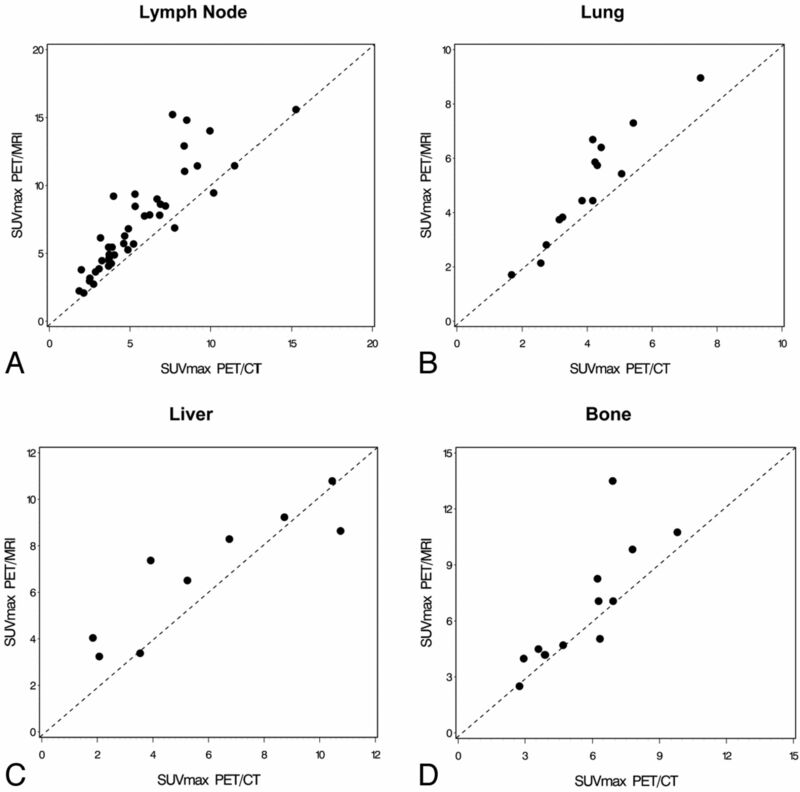 Scatterplots as visualization of the correlations demonstrating SUVmax values in PET/CT and PET/MR imaging for 18F-FDG-avid lymph node (A), lung (B), liver (C), and bone (D) lesions. The SUVmax values are strongly based on the attenuation-correction maps, and the attenuation-correction maps are dependent on the anatomic location. The primary tumor and the lymph node lesions are both in the head and neck region. Because the metastases are in different anatomic areas, however, a location-based SUVmax analysis was performed, and the results are demonstrated in Table 3. The scatterplots for visualization of SUVmax correlations of 18F-FDG-avid metastatic lesions in the lung, liver, and bone are shown in Fig 2. High correlations between SUVmax in PET/MR imaging and PET/CT could be found for bone and liver lesions (Spearman r = 0.89 and 0.88, respectively), whereas a very high correlation was found for lung lesions (Spearman r = 0.93). The absolute SUVmax values were higher in PET/MR imaging compared with PET/CT for bone, liver, and lung lesions. These increases in SUVmax for PET/MR imaging versus PET/CT were statistically significant for bone and lung lesions (P = .034 and P = .0006, respectively), whereas the difference did not reach the significance level for the liver lesions (P = .098). With a dedicated reading session, including radiology and nuclear medicine physicians, detection of lymph node and distant metastases by using whole-body 18F-FDG-PET/MR imaging in patients with head and neck cancer was equal to PET/CT. Regarding the lesion-based analysis, the intrareader agreement was substantial for the first and second readings, and the inter-reader agreement (first reading) was moderate. Regarding the analysis of the presence or absence of metastatic disease, the intrareader agreement for the first and second readings was substantial to almost perfect, and the interreader agreement (first reading) was almost perfect. Very high correlations between SUVmax from 18F-FDG-avid lesions in PET/MR imaging versus PET/CT were found. In the quantitative analysis part, we evaluated SUV correlation per type of lesion (primary tumor or lymph node or distant metastases) and per anatomic localization. As mentioned previously, it is important to conduct a localization-based analysis due to the crucial role of attenuation correction and its dependency on the anatomic region. In both analyses, very high correlations were demonstrated, thus allowing the reliable use of the values in patients with head and neck cancer for quantification of tracer uptake and lesion assessment. Furthermore, the high number of distant metastases detected demonstrates the crucial role of a whole-body approach for staging and re-staging in this patient population. A recently published feasibility study using 18F-FDG-PET/MR imaging for initial staging of 20 patients having head and neck squamous cell carcinoma confirmed the possibility of applying the hybrid imaging technology to this patient population without compromising image quality.21 18F-FDG-PET/MR imaging was compared, in this study, with a traditional 18F-FDG-PET scanner. Malignancies could be detected with PET/MR imaging, PET alone, and MR imaging alone in 17, 16, and 14 of the 20 cases investigated. Significantly more 18F-FDG-avid lymph nodes were detected in PET/MR imaging versus PET. Furthermore, the SUVs in tumor and the cerebellum were significantly higher when comparing PET/MR imaging versus stand-alone PET.21 This observation is in accordance with our study in which the absolute SUVmax were higher in PET/MR imaging versus PET/CT as well. In comparison with their study, the current study compared whole-body 18F-FDG-PET/MR imaging versus 18F-FDG-PET/CT instead of a stand-alone PET. We included, in this study, the 2 most common histopathologic types of head and neck cancer, namely squamous cell carcinoma and adenocarcinoma. Absolute SUVmax values were higher in PET/MR imaging compared with PET/CT. The higher SUVmax reached statistical significance in the lymph node and metastatic lesions. In primary tumors, the SUV difference was minimal, not reaching statistical significance, but this can be explained by the small number of primary lesions (n = 4) and thus low statistical power. When analyzing the metastatic lesions per region, again this study found higher SUVmax in PET/MR imaging versus PET/CT, reaching statistical significance for bone and lung but not liver lesions. We explain the results by the measurement of PET/MR imaging after PET/CT in most patients (12 of 14) leading to an increased tracer uptake with time. However, different attenuation-correction techniques may also contribute to these findings. With regard to the SUV analysis, it is crucial to do correlative studies between PET/MR imaging and PET/CT. In the previously published study of our group comparing SUVs from 18F-FDG-PET/MR imaging with 18F-FDG-PET/CT in healthy tissue, high correlations for SUVmax and SUVmean were found.10 In certain tissues, the absolute SUVmax and SUVmean differed significantly, but when a good correlation was shown between PET/MR imaging and PET/CT as the standard method, the values from PET/MR imaging could be used reliably in the clinical settings for follow-up comparisons. Attenuation-correction solutions based on MR imaging data are one of the major challenges for PET/MR imaging.22 Attenuation correction has an impact on both SUVmax and SUVmean. According to our experience with PET/MR imaging, workflow and associated time constraints frequently pose a challenge in PET/MR imaging. In this study, the PET/CT examination lasted 17 ± 2 minutes and the PET/MR imaging study took 29 ± 31 minutes. This study and others demonstrate that that the scanning time in PET/MR imaging is slightly longer compared with PET/CT.21 This may change in the future when a full diagnostic MR imaging protocol is integrated into the PET/MR imaging workflow. The study has limitations. First, only 14 patients with head and neck cancer were enrolled in this prospective study. Second, we did not have a uniform diagnostic MR imaging protocol. Besides the whole-body T1-weighted sequence for attenuation correction, we acquired, in 12 of the 14 patients, extra MR images, but the protocol was not unified. Third, the first 12 of the 14 patients with head and neck cancer underwent PET/CT, followed by PET/MR imaging. Only the last 2 patients had PET/MR imaging first. A randomization approach during the entire study would have been better from a scientific perspective, but when we started the clinical PET/MR imaging program, we decided, due to ethical reasons, to give the clinically referred PET/CT examination priority, followed by the PET/MR imaging study. The detection of adenopathy and distant metastatic disease is reliable with whole-body 18F-FDG-PET/MR imaging compared with state-of-the art 18F-FDG-PET/CT imaging in head and neck cancer. This is reflected by the moderate-to-substantial inter- and intrareader agreements with regard to head and neck lesion detection (pooled across regions) and by the substantial to almost perfect inter- and intrareader agreements with regard to detection of the presence or absence of metastatic disease. Very high correlations between SUVs in PET/MR imaging versus PET/CT of 18F-FDG-avid lesions were demonstrated, thus enabling the reliable use of SUVs in this patient population. Head and neck cancer is one of the promising indications for PET/MR imaging. P. Faulhaber and M.R. Robbin contributed equally to the manuscript as senior authors. Disclosures: Sasan Partovi and Chiara Gaeta—RELATED: a grant from Philips Healthcare in support of this study. * Andres Kohan—RELATED: under a research fellowship partially funded by Philips Healthcare. Jose Luis Vercher-Conejero— RELATED: a State of Ohio Frontier Grant, which funded the PET/MRI system*; some studies were partially funded as part of a research agreement between Philips Healthcare and Case Western Reserve University. Christian Rubbert—RELATED: fellowship funded under a joint research agreement of University Hospitals Case Medical Center, Case Western Reserve University, and Philips Healthcare. Mark D. Schluchter—RELATED: per an agreement with Dr Faulhaber, work for biostatistical analyses conducted by biostatisticians on this article, who are members of the Case Comprehensive Cancer Center Biostatistics Shared Resource, was reimbursed in part via a chargeback mechanism used by the Shared Resource. Peter Faulhaber—RELATED: a grant* and travel support, both in support of the study and paid by Philips Healthcare. *Money paid to the institution. This work was investigator-initiated and was funded by a research grant from Philips Healthcare. The PET/MRI system was purchased through a State of Ohio Third Frontier Grant. Paper previously presented at: Annual Meeting of the American Society of Head and Neck Radiology, September 25–29, 2013; Milwaukee, Wisconsin. Accepted after revision March 24, 2014.